Richard Rowley - the pen name of Richard Valentine Williams - was born at 79 Dublin Road, Belfast in 1877 the second of six children of John and Jessie Williams. When he was still a child his family moved to Holywood where he attended Sullivan Upper School. At 16 he left school and entered the family firm of McBride and Williams, which in a linen town manufactured cotton handkerchiefs; in due course he became its managing director. After the firm's collapse in 1931 he was Chairman of the Northern Ireland Assistance Board. In the meantime he had earned a reputation as a poet. 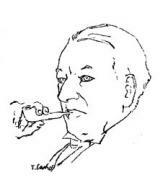 His early poems, in The City of Refuge (Dublin, 1917), were somewhat rhetorical celebrations of industry; but his next volume, City Songs and Others (Dublin 1918), includes his most quoted poem The Islandmen: "Terrible as an army with banners,/ Through the dusk of a winter's eve,/Over the bridge/The thousands tramp." More importantly perhaps, it also had some of those Browning-like monologues put in the mouths of Belfast working-class people (The Stitcher, Oul Jane) as well as the folksier utterances of the farming folk of Mourne, such as Reticence and Thinkin' Long - Rowley had by now moved to Newcastle, Co Down - which are arguably his best work. He also wrote short stories - Tales of Mourne (London, 1937) - and at least one highly successful play, Apollo In Mourne (London, 1926: Belfast, 1978), in which the Greek god, banished from Olympus, comes to earth in the Mourne country, to devastating effect. In his final years he was working on a series of Bardic Tales, based on Celtic mythology, which, though impressive, have never been published.